The digital album is available on: iTunes, Amazon MP3, BandCamp, Spotify. 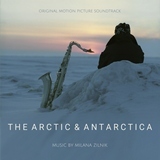 The soundtrack album for the first documentary that I scored. The film was directed and produced by our friend, Liss Ross, who visited both frozen lands: Arctic and Antarctica. Nature themes can be heard in my music quite often, yet it was intriguing and challenging to write music about the Arctic and Antarctica – places I’ve never been to myself. What music could suit those frozen deserts? Ambient, haunting and cold are the first epithets coming to one’s mind, yet this relatively short film was packed with different, often contrasting moods. Of course, there was a place for the haunting and ambient atmosphere but it was so much more: the adventurous journey, playful encounters, diving into mysterious deeps, edgy life-threatening situations and a sweet nostalgia when it was the time to bid farewell. These were the scenes and the moods I aimed at writing the music for: different emotions, different styles, different instruments – the whole world of music coming together to meet at the Earth poles. There was a soaring vocal ballad inviting you to the Arctic and Antarctica. There was a Latin tango of the journey to those distant lands, driven by ethnic percussion, groovy bass, sweet accordion and a singing sax. There was a humorous swing and rag with tribal ethnic drums, percussion and... tuba! Tuba always sounds a bit funny and cartoon-ish to my ears – so were the penguins and seals, playful and clumsy. There was a dark mysterious ambient synth taking you to the freezing underwater. There was a tribal vocalization, primeval and shamanistic, and there was an ethereal elegy with an exotic eastern touch. A song and a tango, a swing and a blues, a groove and a rag, a ballad and an elegy, a nocturne and a requiem – all those were inspired by watching Liss’s film. The digital album is available on: iTunes, Amazon MP3, BandCamp, CD Baby and Spotify. 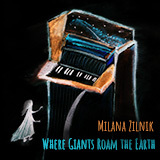 There is a distant land far far away, where giants roam the Earth and music flows as a river. I was lucky to visit that land where pianos grow big as trees, where composer's fantasy meets the magnificent musical reality and the sounds wrap in their enchanting veil. Coming back from that fantasy, I brought its music with me: powerful yet gentle, haunting yet bright and full of life, melodic and turbulent. I invite you to the dream, where giants roam the Earth. Don’t miss the music video! I also have a limited edition CDs and sheet music books (both perfect and spiral binding) that I will personally sign for you if you order via BandCamp. We’d like to tell you a story! A story about the Snow Queen. Not the one you all know about! Not cold, not evil! This is a story about a woman, a woman who had a dream. A romantic one? Of course! With some magic? For sure! Do you want to know how it happened? The single is available on: iTunes, Amazon MP3, CDBaby, YouTube, Spotify. There is no love story that is unique, yet no love story is the same. My love happened to be deeply intertwined with music and with my husband. When he asked me to improvise different feelings on my piano, I didn’t think it would end up as a story of our life: from the anticipation of the first date, from the surprise and joy of new relations to the moments of doubt and fear, disgust and anger, followed by guilt, sadness and contemplation. But above all it always comes down to trust and love. The album is available on: iTunes, Amazon MP3, CDBaby, BandCamp, Spotify. Last summer I had the exciting privilege to meet a very special person - David Klavins, the creator of two unique pianos: The Giant and Una Corda. A gentle power and a shimmering dream. An old wise ocean and a sweet youthful fantasia. Northern Lights and Eternal Rainbow. I am trying to find the right words to express it as I literally got lost when I touched The Giant and Una Corda. I was trapped in the fairy tale where elves are playing their magical harps in a Shimmering Forest. When I came back to reality, the enchantment followed me all the way home and I let it touch the keys and create its magic, loving and improvisational, romantic and jazzy. 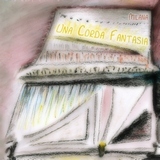 This is how Una Corda Fantasia album was born. For you to listen and enjoy the dream. Whenever I start improvising, I am taken on a journey. Melodies and harmonies constantly move and while they do, they let me create scenes from places I’ve never been to. Yet, the music has the spirit that unites and translates all of that to the listener. The album is available here: iTunes, Amazon MP3, BandCamp, CDBaby, Spotify. 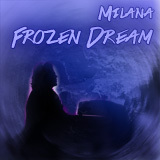 “Frozen dream” is impressionistic soft New Age jazz album, a collection of improvisational dreamy melodies and soft jazz harmonies, both colorful and transparent. Reviews: Simon Reich, Kathy Parsons. My rocking song featuring Rock Flexible on guitars and drums is available in online stores: CDBaby, iTunes, Amazon MP3, Spotify. It never ceases to amaze me how music finds its way to come through us from the world and back into the world. Anything that surrounds us can become the inspiration that ends up being a musical story, a journey on the ivory keys: a sight from a window, child`s laughter, bad weather, good weather, tranquility of a forest, rumbling storms, pain and happiness, madness within and falling in love. Every time I get a chance to escape to my world of music with a touch on keys, I feel like I discover another improvisation hidden in my effort to compose. These improvisations of mine are purely accidental: they are moments in time that never repeat. 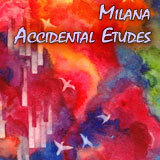 I hope you will enjoy the upcoming piano album with my little “Accidental Etudes”. Reviews: Kathy Parsons (MainlyPiano), Michael Diamond, Dave Greening (ThePianoCloud). Purchase the digital album: BandCamp, iTunes, Amazon MP3. 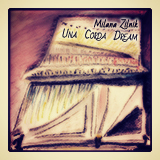 Purchase on CD: BandCamp, CreateSpace. Purchase the sheet music book: BandCamp, CreateSpace, Amazon. Sheet music book reviews: Kathy Parsons (MainlyPiano). BandCamp, iTunes, Amazon MP3, CDBaby! “Petits Reves Bizarres XIII - XXIV” is the second collaborative album with Stephan Beneking. Enjoy the unique combination of Stephan`s neoclassic composition blended with my jazzy improvisation. 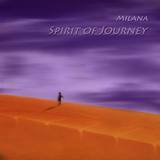 Purchase on CD: BandCamp, CreateSpace, Amazon. “Just Loved” is the debut album with my original songs, featuring a creative and dynamic blend of piano and sensual jazzy vocals. Purchase the digital album: BandCamp, CDBaby, iTunes, Amazon MP3. 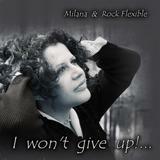 Purchase on CD: BandCamp, CDBaby, Amazon. 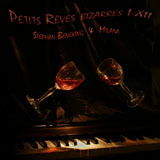 “Petits Reves Bizarres I - XII” is the first collaborative album with Stephan Beneking. Purchase the digital album: BandCamp, iTunes, Google Music, Amazon MP3. “Filling the emptiness” is my second album that includes the best of my piano improvisations recorded in 2012. The CD includes three poems from the “Filling the emptiness” Poetic Challenge. 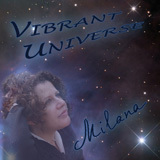 “Vibrant Universe” is my first album in “New age” genre. It includes instrumental and vocal tunes reflecting various moods of our world and beyond.